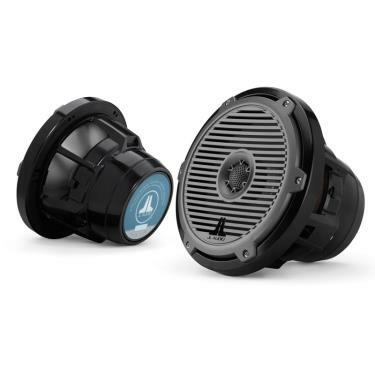 The same principle that makes our 7.7-inch marine speakers dominate over conventional 6.5-inch designs is delivered in a more powerful dose in our M880-CCX 8.8-inch coaxials. These 8.8-inch diameter monsters offer significant performance advantages over our 7.7 inch models, and a huge advantage over conventional 6.5 inch marine coaxials. Thanks to 36% more cone area and almost double the excursion capability, the M880-CCX's are capable of +6 dB greater low frequency output than our M770-CCX 7.7-inch coaxial systems! The bass is so impressive that the M880-CCX can be used without a subwoofer while still packing a very serious low-frequency punch. Used with a subwoofer, they offer vastly better dynamics and mid-bass impact than smaller speakers, making them the best choice when ultimate performance is desired. To make sure that the high-frequencies sound just as good as the bass, our engineers have designed an oversized (1.20-inch), silk dome tweeter for this model. This new tweeter plays louder, cleaner and extends lower in frequency to better mate with the 8.8-inch woofer. A high-quality, true 2-way crossover network precisely filters and balances the coaxial system for outstanding fidelity. Although M880-CCX Coaxial Systems can be used with as little as 50 W per channel, for best audio performance we recommend amplifiers capable of between 125-250 W of continuous power per channel.